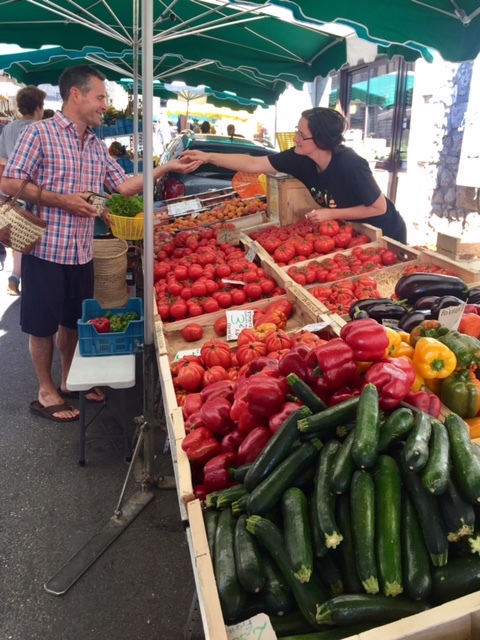 HAPPY MARKET DAY! 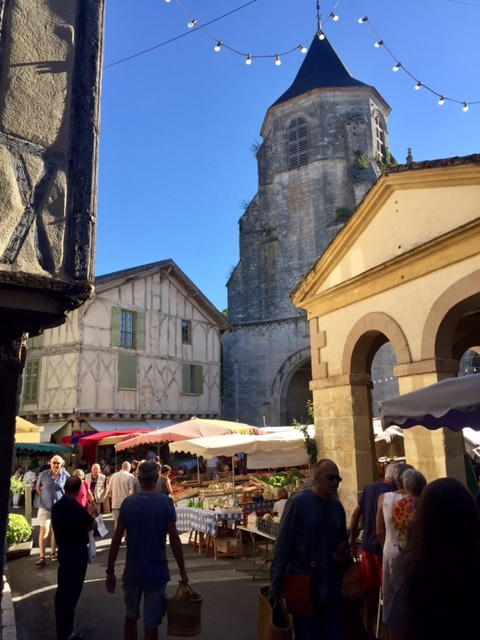 Sundays are the BEST, because that's when the Issigeac market is on. 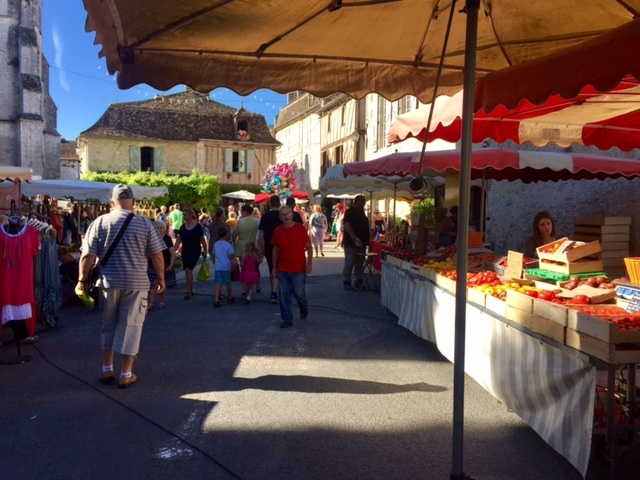 The entire village - every square, every lane - is taken over by stall after stall of everything you could possibly want. Goat cheese? Handwoven baskets? 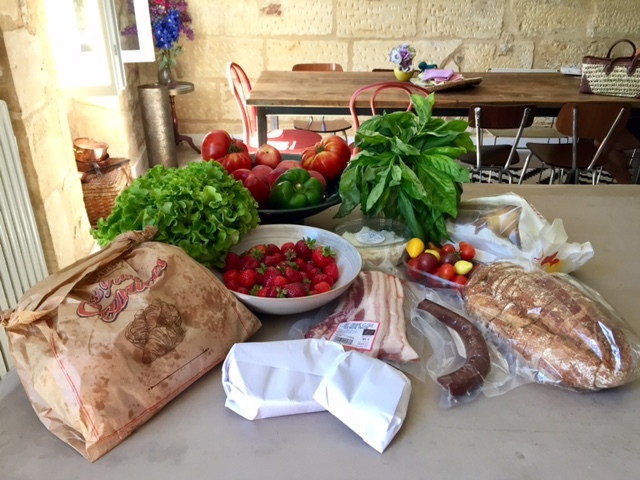 Heirloom tomatoes, baguettes, leather belts? Check, check, CHECK. You won't even have to go to a supermarket to supplement your shopping. We got there around 9:30, which apparently is their crack of dawn because some vendors were still setting up and it was quiet enough we could pick out what we wanted without crowded madness. We finally did it right - previous to this we've often gone around 11 and couldn't move for the people, let alone conduct an actual transaction. Seen here: also not crowded. Also, TOMATOES WITH FLAVOUR. Probably got them from Spain. Alan, exchanging goods for money, a classic barter. 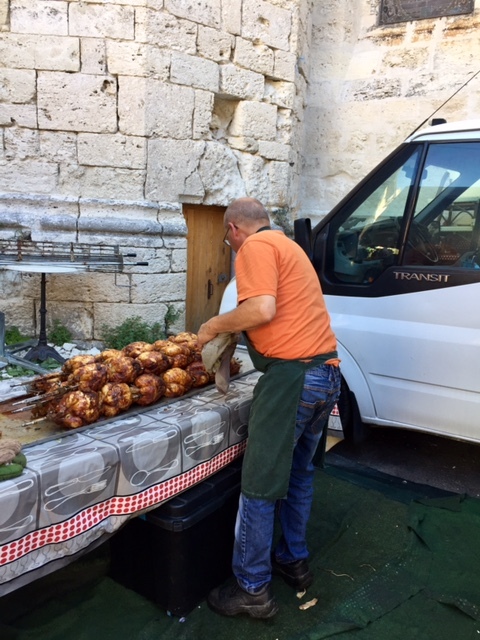 NOW LET'S TALK ABOUT THE ROTISSERIE CHICKEN: this reminded me so much of the rotisserie at the San Francisco Ferry Building market that I had to join the line. (Yes, there was a line, even in this quiet hour. THAT'S HOW GOOD THIS WAS.) The smell: heaven. The fat dripped down the rotating birds from the top to the bottom, and the anticipation was obscene. 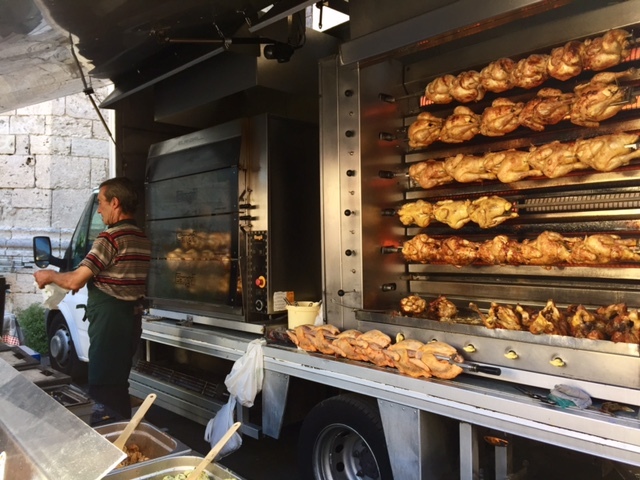 The lowest rail - the one with all the fat dripping - was removed when done and each chicken was slid off, like so much chicken butter about to be smeared on a fresh sourdough loaf*. 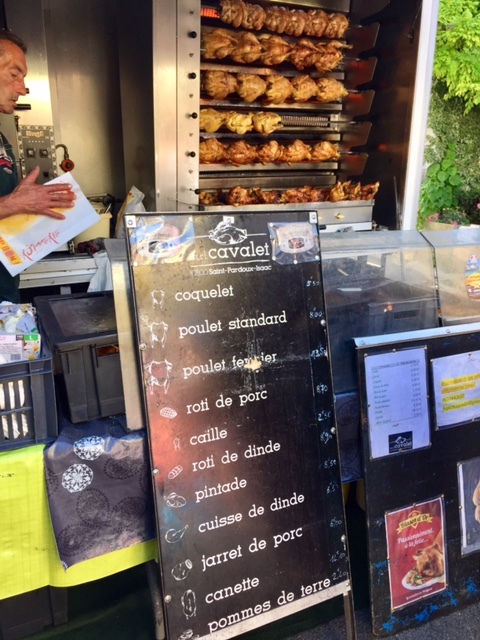 We requested the smallest one - the coquelet - and the gentleman gestured a question in French, to which we responded - without knowing exactly what he asked: OUI. OBVIOUSLY oui. He nodded, turned, and then DIPPED A LADLE INTO THE FAT DRIPPINGS AND POURED IT INTO THE CHICKEN BAG. It's the transparent white bag to the right of the basil. THAT BAG WAS NOT ORIGINALLY TRANSPARENT. What you're seeing there is a window into heart disease, a window we are about to climb through, with some delight. Speaking of delicious fat, see the brown paper bag at the front left, also with grease marks? BUTTER CROISSANTS. The french are FIENDS, I tell you. FIENDS. The white parcels are cheese and the sausage is boudin noir (blood sausage, like black pudding, also our favourite). The rest of the stuff is fruit and vegetables because I guess healthy? Me: How many should we get? Two? 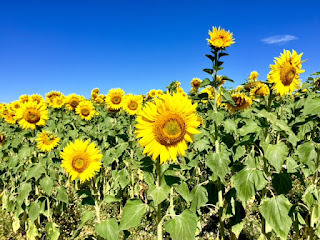 Then we drove back, through DISGUSTING SUNFLOWER FIELDS. We also passed them on the way down, but we were so intent on the Croissant Horizon we only gave them a vague wave and a promise to return. Which we did, because Good Friends Keep Promises. Me: Frolick in them! Alan: is this frolicking? Tall Sunflower: I'm frolicking. 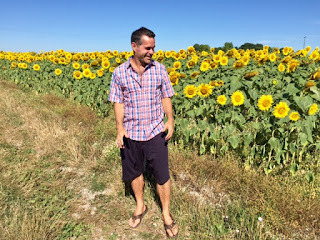 Unanticipated side effect of taking a photo with sunflowers: if they're facing the sun, so are you. 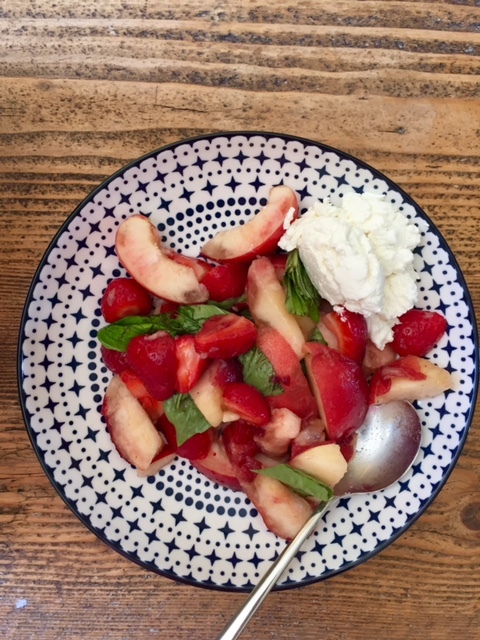 When we got home, we realised the peaches and plums had been sitting under the strawberry punnet and the eggs and because they were so ripe, they had split and gushed everywhere. Result: emergency fruit bowl with basil and fromage frais. The plus side was it helped us hold off on shoving an entire chicken in our mouths for another couple hours. TAKE THAT, FIVE-A-DAY. Tomorrow is shaping up to be equally romantic: we're getting our septic system cleaned! Stay tuned, because sh*t's about to get REAL**.